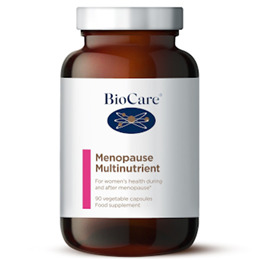 BioCare FemGuard is a comprehensive multivitamin & mineral formulated for women during the menopause. This improved formula now contains vitamin A, B3 & K, green tea and boron, with higher levels of bilberry, grapeseed, magnesium, vitamins B5 & D.
Provides nutrients in their most bioavailable form for optimum absorption. Magnesium Citrate, Vitamin C (as Magnesium Ascorbate), Calcium Citrate, Potassium Citrate Capsule Shell (hypromellose), Pantothenic Acid (as Calcium Pantothenate), Zinc Citrate, Vitamin E, (as D-Alpha Tocopheryl Succinate), Vitamin B6 (as pyridoxal-5-phosphate), Choline, Bitartrate, Niacin (as nicotinamide), Bilberry Extract (Vaccinium myrtillus Berry), Corn Starch, Inositol, Potato Maltodextrin, Thiamine, (as Thiamine hydrochloride), Di Calcium phosphate, Riboflavin, Manganese Citrate, Bulking Agent, (Cellulose), PABA, (Para Amino Benzoic Acid), Olive Oil, Anti-caking Agent, (Magnesium Stearate), Modified Tapioca Starch, Microcrystalline Cellulose, Green Tea Extract (Camellia Sinensis Leaf), Grape Seed Extract (Vitus Vinifera Seed As Vitaflavan), Beta Carotene, Copper Gluconate, Sunflower Oil, Acacia Gum, Chromium Picolinate, Citric Acid, Vitamin A, (as Retinyl Palmitate), Surcrose, Antioxidants, (Natural Mixed Tocopherols, Ascorbic Acid & Ascorbyl Palmitate), Folic Acid PotassiumIodide, L-selenomethionine, Sodium, Sodium Molybdate, Sodium Borate, Biotin, Vitamin B12 (as Hydroxycobalamin), Vitamin K (as Phylloquinone), Vitamin D (as Ergocalciferol). Take 1 vegicap, 3 times a day with food, or as professionally directed. Long term intake of amounts greater than 25mg of zinc daily may lead to anaemia. This product should not be used as a substitute for a varied balanced diet and a healthy lifestyle. Do not exceed the recommended daily intake. If you are under medical supervision. Please consult a doctor before use. 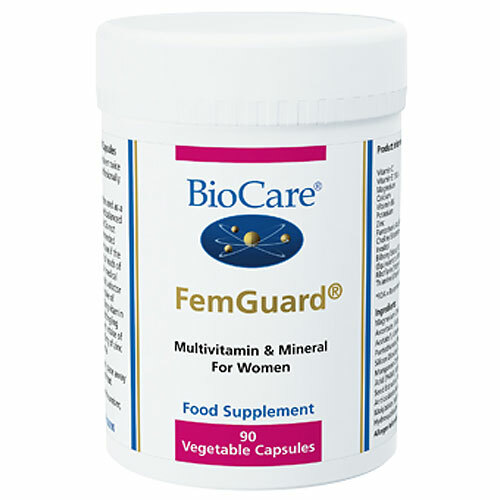 Below are reviews of FemGuard - Multivitamin for Women - 90 Vegicaps by bodykind customers. If you have tried this product we'd love to hear what you think so please leave a review.